Water is a huge need for our homeless guests to combat the summer heat. Without water, homeless individuals may face illnesses and death. Every day, thousands of guests visit our five Valley dining rooms and downtown campus. On days with heat advisory warnings, we open our facilities for extended hours to give our guests respite from the heat. However, many guests need bottled water to take with them when they go out to look for employment and housing. Knowing this, a group of sixth graders at Blessed Pope John XXIII Catholic School and the parish, St. Bernadette, joined forces to hold two water drives for St. Vincent de Paul. Those at Pope John XXIII Catholic School took part in the drive as part of their Faith in Action Service project. They were able to collect over 10,000 bottles of water. 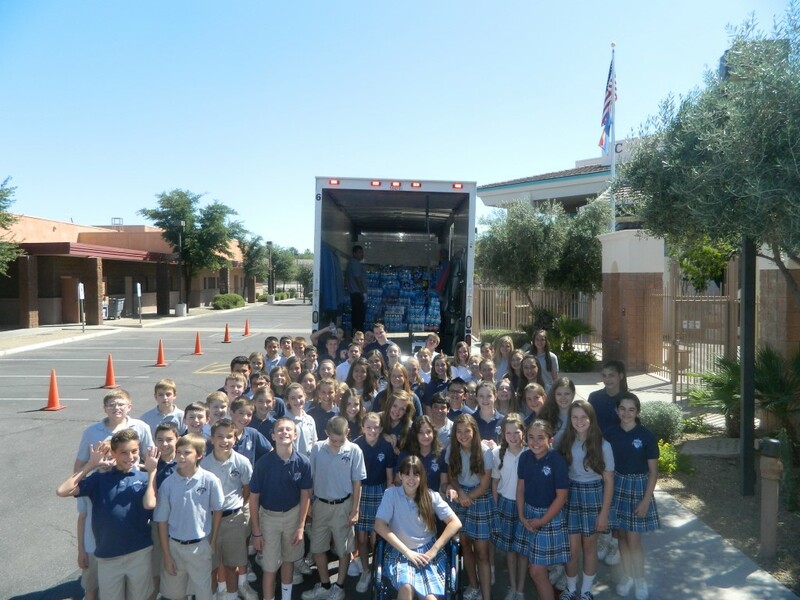 St. Bernadette has taken part in water drives for several years. This year, the parish collected over 3,000 bottles of water. The two drives’ combined effort exceeded 13,000 bottles of water (over 400 cases)! We’re so appreciative of their efforts to help our dining room and ministry guests! Help ensure that our homeless guests get enough water this year by donating water to our facilities or donate online. If you’re interested in starting your own water drive, please contact our drive coordinator at drives@svdpaz.org.